The Plaza de Panama in Balboa Park, San Diego is returning to its pedestrian-only plaza roots, rather than keep it as a parking lot. Residents in Jackson Heights, Queens, New York worked with the City to get a car-free street on Sundays in July and August in 2008, then successfully expanded it to become permanent in all of July and August. Check out the scene here. A bit late to the party, the City of L.A. has gotten on board with the Ciclovia movement on 10/10/10, CicLAvia where 7.5 miles of streets were closed to cars, replaced by 10,000 pedestrians. Meanwhile, the City of Hoboken, New Jersey is giving residents $500 to get rid of their cars and parking permits. 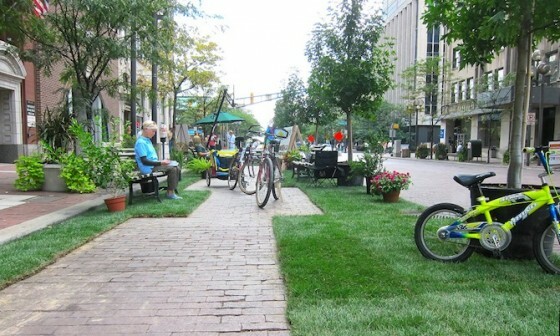 Park(ing) Day held its 5th annual international day-long event in September to transform streetside parking spaces into places for people (see image above). 2010 saw over 1000 such parklets in 140 cities, 21 countries, and 6 continents. Check out the photos here. Not to be outdone, New York City’s Department of Transportation introduced a Pop-Up Cafes two-year pilot program in November, 2010, which essentially make those aforementioned park(ing) spaces permanent. Also globally, over 1000 cities in 40 countries participated in the 11th annual World Carfree Day in September. The event could sure use a PR person, because there’s no overall summary of the event outside of individual city reports, like Washington DC with 7000 participants. What we’ll likely see more of is what Londoners are experiencing in their revitalized public spaces: urban gardens and music festivals; “pop-up” shops, restaurants, art studios and cinemas in empty urban spaces; and lots of outdoor ping-pong tables.